President Donald Trump and first lady Melania Trump visited Corpus Christi, Texas yesterday before headed to Austin to meet with state officials to discuss what needs to be done following Hurricane Harvey. President Trump told a crowd of Texans who’d lined up outside a Corpus Christi firehouse, that the recovery effort is ‘going well’ and his administration is ‘here to take care of you’. The President praised state and federal officials for their response to Harvey. Trump went on to say to flood victims gathered in Corpus Christi, “I will tell you, this is historic.” It’s epic, but you know what? It happened in Texas and Texas can handle anything.” At the conclusion of Trump’s remarks, he thanked Abbott, promised to get Texas “back and operating immediately” and waved a Lone Star flag, to which the crowd responded with cheers. President Donald Trump backed off his claim that Texas would be ‘up and running very, very quickly’ after Tropical Storm Harvey on Tuesday afternoon. The president mused during a briefing at the Texas Department of Public Safety that the flood waters in southern Texas, which has seen record-breaking rainfall, might never recede. ‘Nobody’s ever seen this much water. The wind was pretty horrific, in particular, but the water has never been seen like this, to this extent. And it’s, maybe someday going to disappear. We keep waiting,’ Trump said this afternoon in Austin. His wife soon followed with an official statement of her own. ‘The effects of Hurricane Harvey will be felt in Texas, Louisiana, and other parts of the country for many months and years to come,’ she said. Areas east of Houston, Texas have been drenched with more than 50 inches of rain. The storm continues to hover over southeastern Texas and parts of southwestern Louisiana. 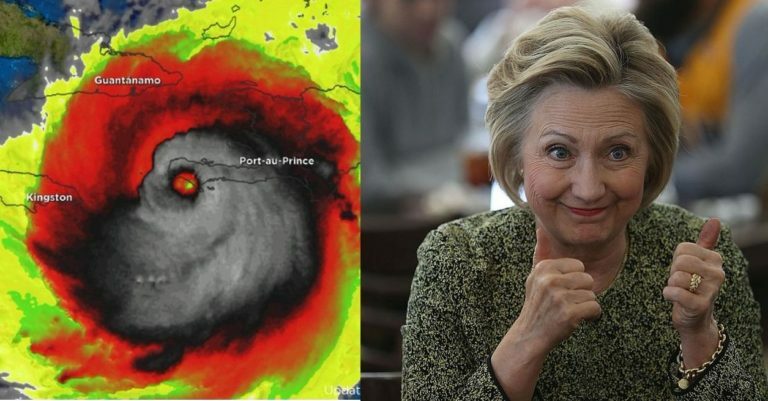 TALK ABOUT DEPLORABLE … Team Hillary was forced to delay the running of her political ads on the Weather Channel during Hurricane Matthew as they faced a backlash from the public. Maybe Hillary should have donated the $63K to Hurricane relief rather than a pathetic ad buy during a time of crisis. But as we know, Democrats never let a good crisis go to waste. Hillary Clinton wanted to take advantage of Floridians and having them watch her political ads as they faced Hurricane Matthew and were potential victims during a natural disaster. But Hillary cares more about herself and her political ambitions than she does the people of Florida going through a natural disaster. Now, Hillary Clinton looks like an exploitative fool as she was forced to delay the ads due to he bad judgement. Once again America I will say it, WAKE THE HELL UP … WHY WOULD ANYONE VOTE FOR SUCH AN INDIVIDUAL WHO PUTS THEMSELVES BEFORE WE THE PEOPLE!!! The Hillary Clinton campaign has delayed a planned Florida ad buy on the Weather Channel after facing criticism for targeting voters in the path of Hurricane Matthew. “We have requested that stations in Florida delay any of those ads on the Weather Channel until after the storm passes,” spokesman Jesse Ferguson said in a statement Thursday. Politico first reported that the Clinton campaign had planned to spend $63,000 on Weather Channel ads in Florida over a five-day stretch starting Thursday, just as the storm nears the coast. Politico noted that Donald Trump and other candidates have advertised on the same channel this year. But the bid to capture support from anxious Florida residents in the path of a deadly storm that has triggered mass evacuation orders and is expected to strengthen soon into a destructive Category 4 created a bit of an optics problem. “If they’re out being too political at a time when the country has its prayers with the people affected, I think it could backfire,” Rep. Greg Walden, chairman of the National Republican Congressional Committee, told Fox News earlier Thursday, before the delay was announced. The search continues for the missing US flagged cargo ship El Faro which left Jacksonville, Florida, en route to Puerto Rico on Tuesday. According to accounts, at 7:20 a.m. Thursday, the Coast Guard said it received notification that the ship had lost propulsion and had a 15-degree list as the ship was caught in the middle of Hurricane Joaquin. There has been no communication with the ship since. There are 33 crew members aboard the cargo ship, 28 of which are Americans that is currently lost at sea. Search crews are continuing to look for a U.S. cargo ship caught in Hurricane Joaquin, one day after a life ring from the ship was found. U.S. Coast Guard, Navy and Air Force planes and helicopters are looking for the El Faro across a broad expanse of the Atlantic Ocean around Crooked Island today. They resumed their efforts at first light. The U.S. Coast Guard found a life ring Saturday – the first trace of El Faro. The discovery serves as validation that search crews are in the right area. Two additional life rings have been found, the Coast Guard said, but it’s unclear if they belonged to the ship. The 790-foot cargo ship vanished 72 hours ago, near the eye of Hurricane Joaquin. The ship is carrying 28 U.S. citizens, as well as five Polish nationals. El Faro was traveling from Jacksonville, Florida to San Juan, Puerto Rico as Joaquin churned over the Atlantic Ocean. The ship sent a distress signal at 7:20 a.m. Thursday saying it had lost electricity, was taking on water and listing at 15 degrees. UPDATE I: Search for missing cargo ship in Bahamas enters third day. Search-and-rescue crews found three life rings in waters to the northeast of Crooked Island in the Bahamas, about 75 miles (120 km) from the ship’s last known position before it went missing, the Coast Guard said on Sunday. The Coast Guard confirmed that one of the life rings was from the El Faro. “Because we found a life ring doesn’t tell us anything more than that we are searching in the right area,” said Coast Guard spokesman Petty Officer Bobby Nash. The Coast Guard and U.S. Air Force sent out four C-130 search and rescue planes at dawn on Sunday, and at least one Coast Guard ship was headed to the area, Nash said. Embattled NBC News Anchor Brian Williams Taking Leave of Absence Amid Iraq Faux Helicopter Story … Is This the Beginning of the End? UPON YOUR RETURN? Don’t count on it. It is beginning to sound like all Brian Williams does is make stuff up to a made for TV movie, rather than the truth of what actually happened. Helicopter hard landings in Iraq, taking enemy fire, looking down the very tube of an RPG and even seeing floating bodies post Katrina, Williams may want to write Hollywood movie scripts, rather than report the news, because it would appear he had an issue reporting facts. Brian Williams said Saturday that he will step aside as anchor of his nightly NBC News broadcast for “several days” as a result of the controversy generated by his comments about his reporting during the Iraq war and Hurricane Katrina. With his troubles mounting by the day, Williams said he had decided to take himself off his signature newscast, “Nightly News with Brian Williams,” while NBC looks into statements he has made about his work in interviews stretching back more than a decade. Williams, 55, has been under fire since Wednesday after he apologized to a group of Iraq war veterans for apparently exaggerating the danger he and an NBC News crew faced while covering the start of the war in 2003. Williams had described coming under rocket and gunfire while traveling with U.S. soldiers in a military helicopter that was damaged and forced to land. The soldiers disputed Williams’s account, saying his aircraft had not been fired upon, prompting Williams to recant the story. From Ace of Spades comes the below VIDEO, Midnight Brian Williams Update: Williams Claimed to Have Looked Down the Very Tube of the RPG That Shot Down the Lead Copter in 2007. Williams may want to remember stories of credibility, not ones that make him sound like he is some brave soul that has escaped death. In the video below he goes on to spew more BS about all these people who died in the Super Dome following Hurricane Katrina. Hmm, I guess we can’t interview those folks to see if Williams is telling the truth, they are dead. Or so he says. Williams says, “We don’t have problems going to dangerous places, a lot of us consider that our jobs.” There lies the lie. Best article name, from the NY Times, ‘Anchors Aweigh’. UPDATE I: Good grief, now there are questions whether Brian Williams reported stories following Hurricane Katrina truthfully. On Friday, NBC network officials said an internal review had been launched to vet Williams’s statements. His comments about his work covering Hurricane Katrina in 2005 are also part of the review. It would appear Brian Williams was full of crap in his reporting on Katrina as well. NBC News launched an internal investigation Friday into statements made by its lead anchor, Brian Williams, about his reporting from Iraq in 2003, as well as stories he told about his award-winning coverage of Hurricane Katrina in 2005. The investigation, confirmed by NBC officials, represents a change in the network’s attitude toward its popular anchor only a day after senior managers appeared to have accepted his apology for misstating the facts surrounding his excursion on a military helicopter while reporting on the start of the Iraq war nearly 12 years ago. Williams and NBC won a Peabody Award for reporting on Katrina’s impact on New Orleans and its surroundings. Williams had recently ascended to anchor, and he flew to report live on the Category 5 storm a few days before it struck Louisiana on Aug. 29, 2005. Williams reported daily from the city’s French Quarter and its convention center and Superdome, where residents sought shelter. Just how ignorant is government bureaucracy? Talk about “Big Government” gone crazy. The answer appears to be quite a bit. Rosanne and Joe Cavaliere, residents in a Queens, NY community actually received a citation for notice from the city for “failure to maintain” their property. Are you friggin kidding me? I guess this is part of the “no red tape” that President Barack Obama promised during his first photo-op when he went to the Sandy ravaged area prior to the 2012 election. Residents in one Queens neighborhood are crying foul after they were written up for failing to clean up the city’s own mess. It is yet another new complication in life after Superstorm Sandy. Rosanne and Joe Cavaliere are still trying to clean up from the hurricane. They have branches through their roof, busted front windows, and, to add insult to injury, they recently received a citation notice from the city. Could you imagine? Folks in NY and NJ are still trying to get back on their feet after Hurricane Sandy that still has many individuals without power and homes and the City of New York in their infinite wisdom look to extort money from victims with such citations. Way to go Mayor Bloomberg. You are a man of the people.